If you subscribe to the S gaugian you saw in the latest issue an article by Roundhouse Bill about his self made Royal Blue Passenger set. I was really surprised to see that article as I too had been working on just such a set since early April of this year. The cars are re-purposed pre-war AF passenger cars (3/16 scale) and are made of metal. They were made around 1940-1941 I think and they were O gauge cars. After the war AF re-released the Royal Blue set in S gauge but never produced blue painted passenger cars to go with the S gauge 350 Royal Blue Pacific loco. I always wanted some matching passenger cars for my 350 engine from set 48T. I acquired enough O gauge passenger cars in a variety of colors, dis-assembled them, stripped all the paint off (soaking them in straight ammonia makes the old paint fall right off and doesn't hurt the metal), primed them, and finish painted them in a nearly perfect rattle-can Royal Blue color straight off the shelves of Walmart. The window trims were painted white where they occurred. I did a little research on the prototype Royal Blue train and found out that the original 1937 heavyweight car sets contained 8 cars each. So I made my set 8 cars. The numbers I used are actual numbers used on the 1937 sets although maybe never in the same train. Then I got a little creative just because I could. I always like "named cars" so I created my own names for the cars. They all had to start with "Blue". I also added the name "Pullman" to every car...again maybe far from real but hey...it's my train! I also added constant voltage LED lighting to every car. That took a little doin' as the cars are all metal and great care had to be taken to insulate the + and - from each other. One 2-wire plug/socket disconnect so the shells could be detached from the chassis if needed. I had to re-truck every car with S gauge trucks. I used all sintered iron side frame trucks as I like the added thickness and detail they show. Wheelsets were all 1 metal and 1 plastic wheel per axle for electrical pick-up. I have yet to decide if I want to paint the side frames silver or not. I currently am using an AF B&O Mikado (TMCC) to pull the set and it looks and runs great. My original Royal Blue 350 has link couplers and can't be attached to the set which is all knuckle coupler. Maybe someday I'll cobble together another 350 with TMCC innards and knuckle couplers. I finished all the cars with "FUTURE" floor wax to give them an extremely high gloss shine. So without further fanfare here's my fantasy Royal Blue Passenger set. Thanks for mentioning my article. I used a pre war engine shell and tender for mine. I used a 5 digit chassis for it with a 2 step E unit and smoke unit too They did not use the color pictures I sent. I used the press on lettering from Port Lines that Gilbert used for the engine & tender. Mine also has knuckle couplers except on the end of one passenger coach so I could use my original Royal Blue engine. How about a video? That has got to be a handsome looking train with all those cars. You did some great work on it. The paint looks excellent and the decals are well-applied. They are a bit on the large size but they look nice and straight. I like your choice of names for the cars - lots of fun there! Super looking train set!! You should be very satisfied!! That guy on the observation platform does bear a close resemblance to you! Do you have a 1:48 twin. Very nice! I tried adding a "like to this topic, but somehow it doesn't look like it went through. I've been thinking about this too, like many guys, but somehow just haven't gotten around to it. Great job! Fantastic!! The eight cars make for a nice long train. I also think the Mikado looks great at the head end. It's unexpected and a real eye catcher. You did a good job on the video, the angle really showed things off. Only suggestion is to slow the train down a bit so we can get a better look at the details as the cars go by. Mark - very nice job on the cars. I have a quick question on the lights - if you run TMCC, that's constant track voltage - so your LED lighting circuit relies on the voltage regulator to keep the voltage to 9 v on the LED's, right? If you were to run conventional, then at lower voltages, the regulator doesn't have any effect up to 9v? I also noticed on the observation car you had lit marker lights - also LED? Mark - thanks for the explanation. For the marker lights, are they something you made or purchased? The best part is I bought the decals from our own forum sponsor LBR Enterprises LLC! Dave at LBR is very helpful and helped me design just the look I wanted for the decals. It's not easy to get custom made decals in WHITE but Dave can do it. Contact him if you want any custom decals made. I just found this thread with your set pictures, WOW!, what a beautiful job you have done. I have some of these prewar cars set aside for this project and you are an inspiration to me to get started on mine. Thank you for the pics, I may be contacting you for some info on the work you have done on these. OMG, where were you when I was 4 years old? My first train was that B&O Royal Blue Freight. I spent the next several Christmases asking Santa for blue passenger cars, and each time he left a note saying he didn't make any. 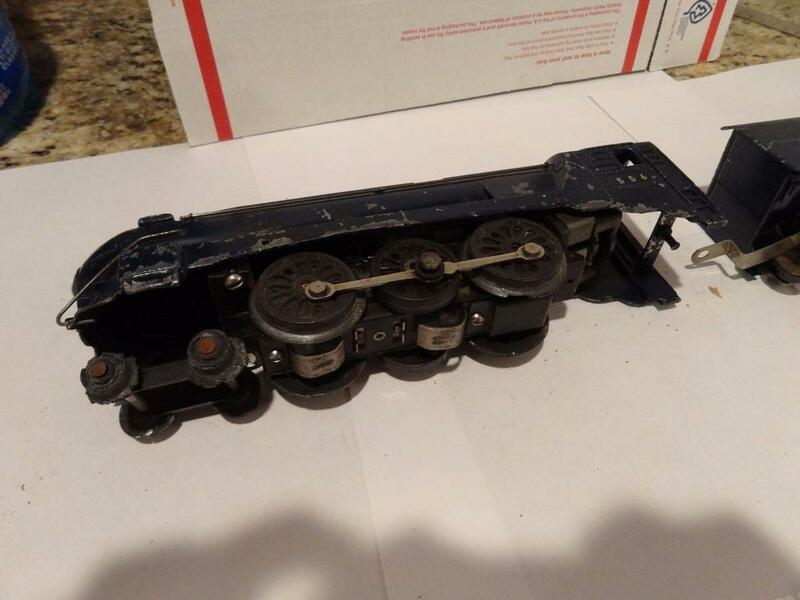 Can you change out one end of the baggage car to have a link coupler truck? Nice!! I need to do this to match my engine rebuild. Could you use S heavyweight passenger cars - or am I missing something? 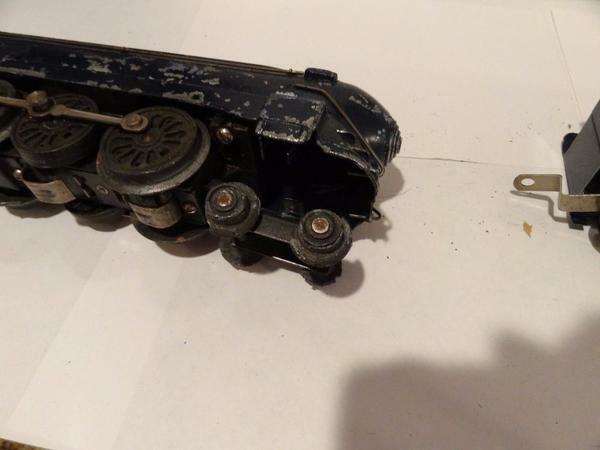 I have a prewar O gauge Royal Blue set with two coaches, a whistling baggage car and the chugging tender if someone is interested. I just acquired a Royal Blue 556 the cow catcher is missing, which I think I can get on-line. The wheels on the pilot truck look really rough. I would like to replace them but not sure of their size. It also looks to be missing the rear truck. I think I've found one but I think the wheels for it have to be ordered separately and are a different size then the front ones. I would measure them myself but am out of the country and only have the pictures of what I bought. I would like to have the parts waiting on me when I return to the US. The steam valve links are missing too, only see what appears to be the steam chest and valve with no link, but the drive wheels are linked. Still looking for Royal Blue passenger cars, would really like to find one like in the photos. If one of you long time collectors can give me a heads up it would be a big help. The 556 is 3/16" scale, but an O gauge chassis. I have a 556 and a 350. I'll check to see if the 350 pilot will fit on the 556. Don't know about the valve gear. They appear to be the same, but I am not sure. My 556 is missing the valve gear. Thank you for checking. I now know that the cow catcher was part of the casting, after looking at many photos of both the 556 and 350. It seams that many of these Royal Blues have broken cow catchers and missing valve gear. The thought even occurred to me that being a Pacific engine that the valve gear could have been used on another engine. Remolding the cow catcher with Aluminum or J & B bond might be fun to try. I think A.C. Gilbert made the 556 and American Flyer made the 350 using the same shell. This makes me think that the valve gear is the same. I'm not sure how that was accomplished with the track width difference. The pilot wheels might be easier to just change with AF 3/4" wheels since the truck looks intact. The Royal Blue/Circus/Silver Bullet uses it's own valve rods and pilot truck AND cab plug board. They don't interchange with any other AF engines.